Many DS stuff on the compos, that's great! This was cool enough for a thumb up. Optimus, wth, I have a Cyclo, and it was recorded off of that, and I'm pretty sure one of the other people has an M3. Goddamn magical incompatibilities. Thanks to us and beer and club mate; Not anymore! so-so. previous demo was much cooler. http://www.youtube.com/watch?v=_JfbN0gBZFE&fmt=18 So I guess we have a video now. very good effects, I like the metaballs and the "zooming cube" especially ! No patching needed with my R4. I didn't expect much because of the screenshot, but seeing the video surprised me. Cool show! Cool and cute. 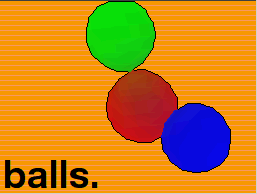 I really liked the RGB balls. Mostly classic effects, but more than okay overall. oh yes this one, had to recall it was a DS one to fully remember. Yay DS. Works on my R4, make sure your card is FAT16 formated, by a windows machine (no idea why). Also, the balls are touching! Btw, in what format the music is? After watching this demo I feel at ease. late thumb is late. very nice tune by coda and nice gfx! nice one.. i somehow missed it at the compo..
Work on the transitions, use better fonts, improve the pacing/rhythm, and you get a winner! You need to put a Demo1.nds on your MicroSD main folder. lots of work and ... coders colors. works on M3 with DSorganize. page created in 0.018244 seconds with 15 queries.